PS but this posted OK! What Board/Thread were you trying to post in? It was in the 2013 events section about Brooklands New Year's Day gathering (http://www.betaboyz.myzen.co.uk/forum/index.php?topic=2075.msg12430#msg12430). 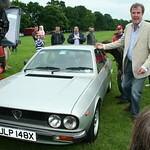 The post was very similar to my post on the LMC forum at http://www.lancia.myzen.co.uk/forum/index.php?topic=5593.msg40153#msg40153. I tried the post several times and it failed on all of them with the same error message. If your refering to your post on the LMC website that has nineteen photos in then yes, it will fail. On the LBF there is a limitation to eight photos per post. Also, I am not sure what the picture size limits are on the LMC forum, but you could be falling foul of that too. The pictures are simply URL pointers to an external gallery. I thought limits only apply to pictures attached to the post. There should be no physical size limits to the pictures as they are not stored with the message and the display size was limited to 800 pixels wide. but as you say they are hosted on another server, I have increased the number of attachments per post to 16, just in case SMF counts these as an attachment ?? Try it posting again, to see if this works ? EDIT: Theo just checked the size of your pic's on the LMC Forum and they measure 1600x1200, try using a reduced size of 800px wide I'm sure that will work ? I tried again and got the same error message. Even though the photos are 1600x1200 they are embedded with [img width=800]<picture URL>[/img] so the displayed size is 800 pixels wide.